You might never hear of this Indonesian Recipe, Chicken with cassava leaves. It's very unique chicken recipe. The flavor of the leaves which are delightful in combination with chicken and Birdseye chilies make this recipe very special. Not many people know about this dish. You won’t find this kind of dish in the restaurant, but maybe you can find this in a few Sundanese restaurants. And these leaves are hard to find outside Asia, that's why people don't really familiar with this chicken recipe. But if you want to know where to buy it, try the Chinese supermarket. You don’t have to use fresh leaves, it's ok to use frozen ones, it is easier to find. It's a great variation and very different than the usual curry chicken or other chicken recipes. 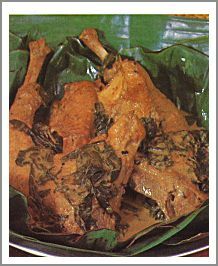 Try it and maybe you would like this authentic Indonesian Chicken Recipe. Make a paste of Birdseye chilies, garlic, turmeric, pepper and salt. Set aside. Line entire bottom of a wok with banana leaves and put the chicken on the top. Mix the spice paste with coconut milk and pour the mixture into the wok. Add the turmeric leaf, Kaffir lime leaves, and the lemon grass. Cover the wok tightly and cook the mixture over medium heat. When the chicken is tender, add the boiled cassava leaves. Bring to a boil. Stirring occasionally. Cover the wok and lower the heat. Continue simmering until santan has thickened and oil comes out.